You know, I don't feel deprived when I have SCD treats in the house. If there's something in my fridge or freezer that is truly delicious, then I have no cravings for things I can't eat. I don't usually even think about the things that are no longer in my diet; I feel so good now that eating that stuff doesn't really interest me any more. I know how I'll pay for it for days afterwards and it's just not worth it. Combine dry ingredients in a mixing bowl, breaking up any lumps. Add melted coconut oil and warmed honey and mix to combine. Roll teaspoons into balls and flatten onto baking tray with palm of hand, allowing room for spreading. Bake in 160 degree Celsius (320F) degree oven for 8-10 mins. In most of my recipes, you can decrease the amount of honey without making any real difference in the outcome, but not in this recipe. You need all of the 1/2 cup of honey and oil to bind it together. I remember the super hard and crunchy Gingernut Cookies that I had as a child. We liked to dunk them in milk to soften them up. You can take these out of the oven after 8 minutes and they will look golden brown, but they are a rather soft cookie. If you leave them in the oven for 10 minutes they come out better; more crunch and flavour. I haven't tried leaving them in for longer, if you do, let me know how they turn out! Hi Leigh, what a great idea! I always cook them all up straight away, but store them in the freezer. I like eating them straight out of the freezer but you can defrost the in them in the microwave. I think the dough would keep about a week in the fridge but I haven't tried it. I guess you could freeze the dough and then defrost and cook whenever you like. I like the Bliss Ball idea; I'll have to give it a try! Wow these are fantastic! 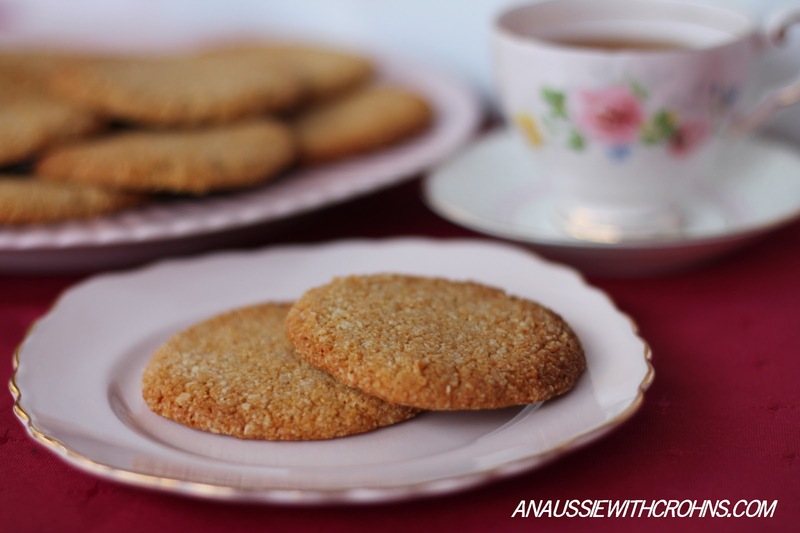 I LOVE gingernut cookies and I've been on the lookout for the perfect paleo version. I've tried and tested so many recipes and they all end up too soft and cakey and lack that crunch that gingernut cookies are known for. Well the search is over! I love that its not too overpoweringly sweet and you get a good batch out of them! I like mine quite gingery so I modified mine using 2tbs ground ginger and about 1/4 cup roughly chopped stem ginger. I got about 40 cookies out of this batch! Amazing! I tried making these cookies for the first time about a week ago. They didn't turn out quite like yours (as in they look like flat granola squares instead of circular cookies), but were nonetheless DELICIOUS!!!!! My mom and I are addicted to them. Do you have any tips to keep them in the circular form so they look more like the typical gingersnap cookie? Hi Rachel, glad you like the taste, but how strange about the shape! Did you use exactly the measurements given and roll them into balls and flatten with the palm of your hand? I can only think it might be the difference in types of almond or coconut flour? Let me know if you discover the culprit, I'm curious to find out too! These came out great. I cooked them a bit longer about 15min, and when they were cool, they were crisp. I added an extra half teaspoon of ginger, and a teaspoon of fresh ginger.